This IBM® Redbooks® Solution Guide describes the IBM MQ Appliance M2000, an application connectivity option that combines secure, reliable IBM MQ messaging with the simplicity and low overall costs of a hardware appliance. The concept behind the IBM MQ Appliance M2000 is simple: Combine the customer-proven scalability and security of IBM MQ messaging software with the simplicity, ease-of-use, and low total costs of a hardware appliance. Enterprises have long used IBM MQ messaging to integrate applications, systems, and services reliably and securely. Now, with the IBM MQ Appliance M2000, IBM adds a state-of-the-art hardware option that is fast to deploy and uses fewer administrative and infrastructure resources than running multiple messaging servers. Messaging servers are only part of the cost of messaging integration. There also is the expense of configuring and maintaining the servers and software, and for many enterprises, the challenge of extending the infrastructure to multiple, far-flung geographic locations. Also, by its nature, messaging infrastructure must be highly available and responsive to enormous fluctuations in demand. Therefore, the industry needs a new approach to application connectivity, one that is fast and easy to deploy, simple to maintain, reliably secure, and cost-effective. With the IBM MQ Appliance M2000, IBM offers the messaging performance of IBM MQ with the convenience and costs savings of a robust physical component. 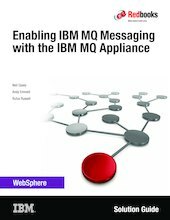 This Solution Guide is intended for enterprises that are considering a possible first use of IBM MQ and the IBM MQ Appliance M2000 and those that already identified the appliance as a logical addition to their messaging environment.